What’s the name of your band? Hey Robex, thanks for this interview. The Band’s name is Bleeding Tears. How was the band formed? A night of beers with friends, each one had the same tastes of music, gothic, symphonic, black metal and decided to form a Band, at the beginnings just were Darwin Gil and Vanessa Murillo both singers, with the idea of a Band , the search of new members started between the years 2004 and 2005. Can you tell about your band? Bleeding Tears is a Gothic Metal Band; the music has the elements own of gothic metal as darkness, melancholy, romantic, religion, and pagan. We mix the symphonic with heavy guitars influenced by the doom and black metal; the voices are the fight between the beauty and the beast. Where are all band members from?/Who does what in the band? Until now all of us are from Venezuela, but there are plans to move to Europe or the United States and a new line up is possible, each one has its own life here in Venezuela, but the current situation in our country is not the best and, if the Band have to leave, we will do all the possible to keep working in our music. 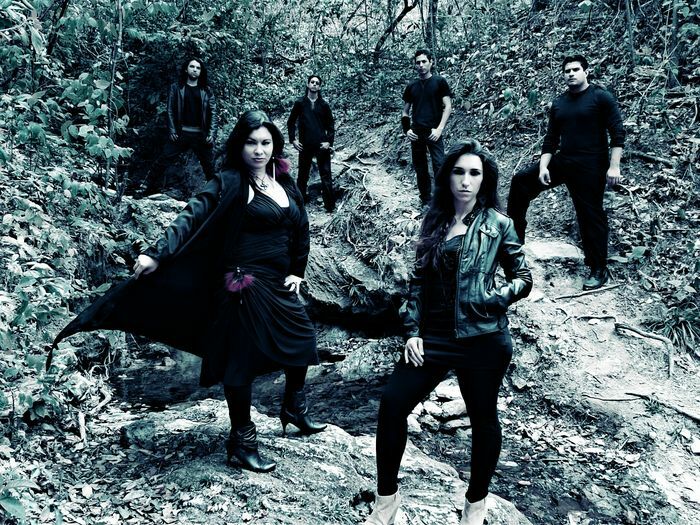 The current lineup is Vanessa Murillo (Mezzo Soprano), Carla Valsangiacomo (Soprano), Darwin Gil (extreme voices), Alejandro Pinto (Keyboards), Jaime Murillo (Bass), Sergio Rivas (Guitars) and two special guests on drums and guitars. What were the ambitions of the band when you started? Start working on songs, record them and promotion. Where was your first gig? The first gig was in the city of Valencia in 2006, the venue was called TMV. Where was the latest gig? Our last gig was in Valencia at the famous venue Teatro Bar. Who writes your songs?/Who writes the music who writes lyrics? All of us work the songs; we don’t have any other producer or make covers. Who has the best since of humor in the band? Each one has humor, one more than the other, but when it’s time to work we focus on it. Why did you pick that particular style? Each one of us find an identity with the style where we can express and drain all the feelings. Do you write your own material or mainly covers? Own material, there’s no sense for covers, if you are a real Band let the imagination flows! Have you made any albums?/If yes what are they? We have recorded one demo, an EP, and our last album a LP “Brother Wolf”, actually we are working on a new EP called “The Fall of Lucifer”. What year was the band started? The Band started rehearsals in 2005. Best/worst gig you've played? The Band has had many best gig, one of them was in Madrid in the Excalibur venue, was our first time in Europe and the experience was awesome! The worst gig was last year in Caracas, we were on show and there was problem with the electricity making us impossible to keep playing. What places will you be playing in the imidate future? Europe and South America. Where have you played from then till now? Till now just in Venezuela, but the Band is working on some bookings out of Venezuela. Witch band is the best you´ve seen? We have seen a lot of great Bands; we had the opportunity to share stage with Epica which is an excellent Band. Is it always the same songs live? Not always, we are working on a new material. What has been the best/most promising gig so far? The whole European Tour. Have you had any bigger tours from start to now? Our last tour in Europe was in 2011, but we are working on a new tour. What are the plans for the rest of the year? Work in the new EP, make some videos and promotion. Where do you usually play? We usually play in the Bars that offer us a stage to play our music. What are your goals with your music? Our goal is to take our music worldwide. Is it easier to get your inspiration from older bands or from bands more modern? Well, it is interesting in some cases; mix the old with the modern. What's the first step when making a new song? Make a track then add the lyrics. How do you feel about the downloading of music instead of buying albums? The digital is great, if you like an album you search it on youtube, i-tunes, spotify, however if you really like the Band there´s no like an album with the booklet. About free download, if you are starting like a Band is a great way to promote your music, also you can sell the album on the gigs. What would be your dreams for the band? Play in Wacken! Besides your own music, what genres and bands do you listen to? Death, black and doom metal, bands like dark tranquility, dimmu borgir, dark funeral, draconian, tristania, sirenia. What songs and what years were they released? Our last album “Brother Wolf” was release at the ends of 2013. What do you work with outside of the band and the music? Each one of us are professionals, Engineers, Designers. What would you do if there was no music? Painting. How important are your fans? The reason to keep working on new songs. How often do you rehearse? Once the Band has a show booked we start working on all the plans to play a great show, every weekend is our ritual in the studio. Where do you rehearse? Home studio while we don’t a have show booked, in a professional studio when there’s a great show coming. Name 2 of your own songs you like at the moment? The Fall of Lucifer and Brother Wolf. Any pearls of wisdom for all other bands out there? Keep working on your own music, record it and show it to the rest of the world. Describe your show, visually and musically All your fears will become true, the sensation that the darkness is holding you. How do you view the music industry of today? A waste of time, right now all the bands are recording and selling its music by themselves. What is best/worst with playing the clubs? The best is that you are in touch with your fans, the worse is that the clubs forget why the people is there and most of the time they want to get all the money from the Bands. How would you describe your sound in one sentence? Darkness. What is your favorite crappy instrument? Drums! What’s your Pre-show ritual? Couple of beers, shake hands and let’s rock! Thank you so much Robex, keep rocking!